Why are some Super User answers not sorted by up-votes? 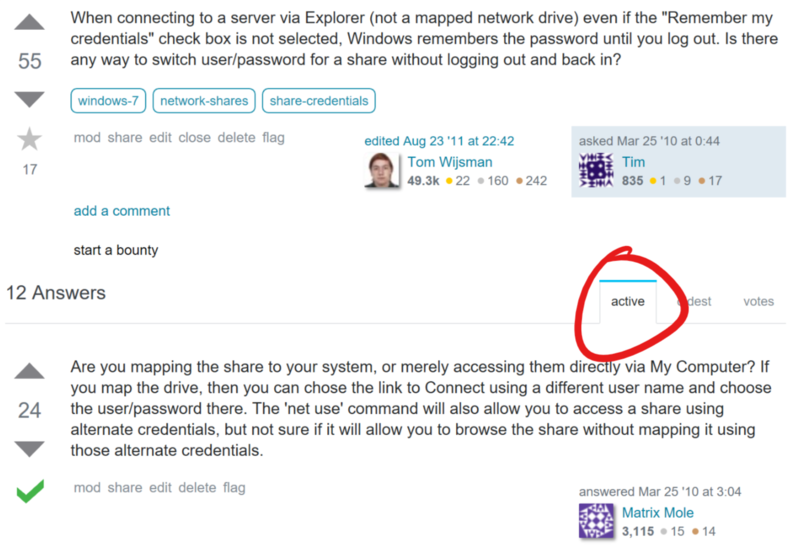 I was just looking at this question on SuperUser: How do I change the user I am logged in with on a Network Share? Unlike other questions, the answers do not seem to be sorted in any particular order at all. I haven't confirmed yet, but I think the only answer that appears legitimate to me is the one with 11 up-votes. But this should have been near the top, and I had to scroll down quite a bit to find it. Is there something wrong with this page, or is there a reason for this strange sorting? The answers (after the accepted answer) are sorted by most recently "active". Either they were posted more recently or edited. You can adjust the sorting using the tabs above the top answer. On the top right of the first listed answer, you'll find a button to sort the answers by either active, oldest, or votes. Yours is probably set to "active" or "oldest". Change it to "votes", and that will fix the problem. Not the answer you're looking for? Browse other questions tagged discussion questions answers voting . Super User attracting too many open-ended/subjective questions? Should number of votes and/or higher answers be listed higher? When are software recommendation answers not an answer? Question in close queue is marked as duplicate, but the duplicate is terrible!